Normally along our North Sea coastline we experience beach sand loss and consequent dune attack from late December to early March, when the powerful northerly winds drive in big waves up our beaches and the undertow takes the disturbed sand out to sea. In late Spring, Summer and Autumn months, the opposite is true. Then the wave height reduces and the predominant south to south-westerly winds push the sea surface out with the equating undertow bringing sand on to the beaches. Before the dredging of sand, the beaches lowered in wintertime were rebuilt, and equilibrium was restored. But not so this past year. In April we lost much beach sand depth, with little rebuild following during the Summer. 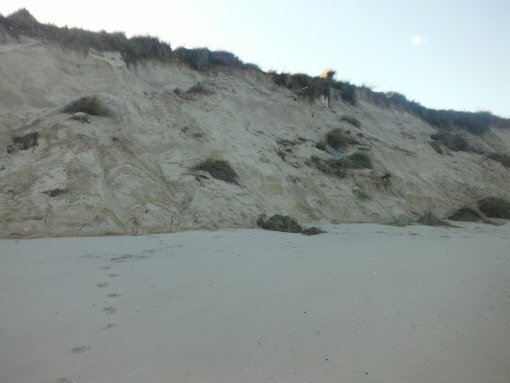 In October, the erosion commenced again with a vengeance. Never before has such erosion resulted in the summer and autumn months. This coming Winter now appears very threatening. 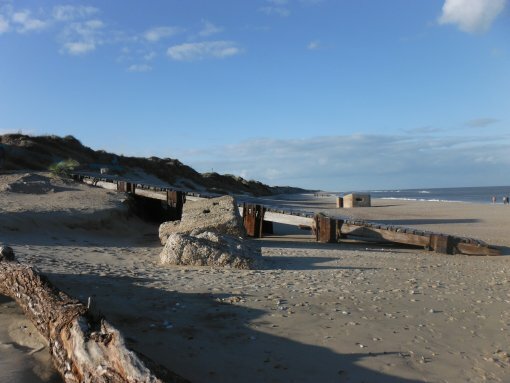 We may well have the sea breakthrough to the Great Winterton Valley SSSISite of special scientific interest, an Area of Natural Beauty (AONB) site,with the consequent possible loss of seaside housing and businesses and lose the tourist beach attraction by March 2013. 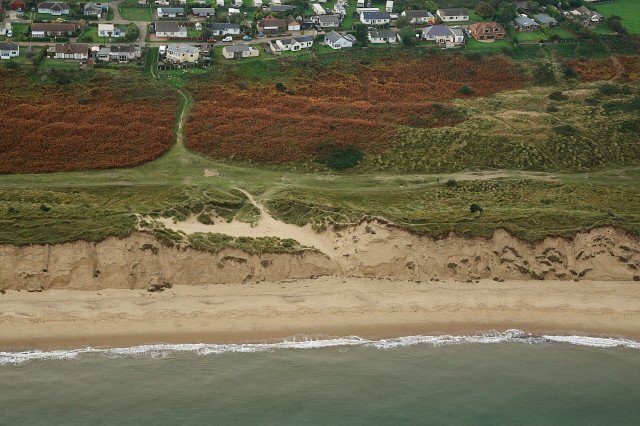 This picture shows the fifty metre cut into the dune face and 3 metre loss of beach sand cover between Hemsby Gap and Winterton was taken by Mike King in mid-October 2012. Mike also took the following from Hemsby Gap looking towards Winterton-on-Sea. It shows the undermined Hemsby Inshore Lifeboat Ramp and the uncovered WW-II defences. This picture was taken by aerial photographer Mike Page on 19th October ’12, with leave of copyright kindly granted to MARINET. It shows the most vulnerable point approximately half way between Hemsby Gap and Winterton-on-Sea. This prime weak point in the dune defence line is due to the large hollow, initially created by the explosion of an incoming V2 in 1945. This large crater became employed as a wonderful sun-trap out of the wind, so popular that the constant treading down by visitors entering and leaving by the path opposite, added to by sand blow, has prevented the re-establishment of Marram. The sea erosion maximum is now adjacent to that point, leaving very little defence from a breakthrough into the AONB should we experience a surge and/or further frontal loss. At he time of taking this photograph Mike spotted no less than seven offshore aggregate dredgers at work. This despite the most recent annual hydrographical survey reporting a ten metre lowering of the offshore seabed.